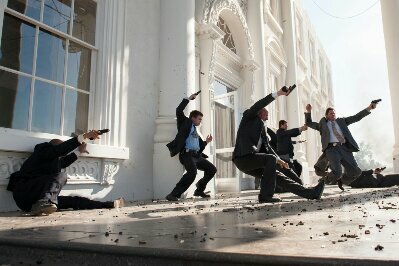 Olympus Has Fallen (2012) – Review – Screenkicker! 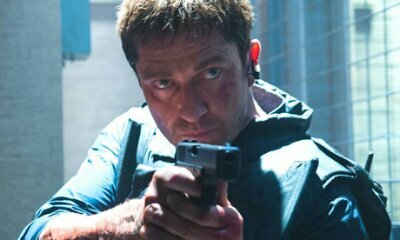 Gerard Butler plays Mike a secret service agent struggling manfully with an American accent making him seem like a bad Scottish spy in Washington. 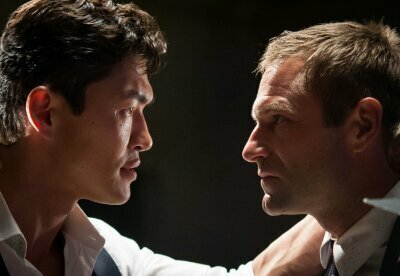 Mike’s job involves protecting the president of the USA (Aaron Eckhart) and his family and talking down his sleeve a lot. Things are going well until one night the prez’s wife goes over the side of a bridge in a CGI limo prompting Eckhart to scream ‘NNNNnnnnooooooo!!! !’ at the sky. Eighteen months later we see that Mike is working in what looks like an accountancy office just across the street from the President’s big white crib. Plagued by flashbacks of the moment the first lady tumbled into a river, Mike wrestles with the guilt of something that wasn’t actually his fault. When terrorists appear and take the building and the president hostage, Mike is the only man to get on the inside to pick off villains one by one. So who are the bad guys this time? Islamic extremists are soooo last year, and Russian separatists aren’t very exciting. Yes you guessed it – North-Koreans. These guys are the only baddies that are a safe option these days, plus chances are this won’t be showing in cinemas in Pyongyang (they’re more likely watching this classic). Anyway these assholes attack Washington and desecrate the sacred ground of the USA. The tragedy is shoved in your face until it culminates in a lingering shot of a tattered, bullet ridden stars and stripes flag billowing limply in the setting sun. The bastards even knock down that big tall pointy stone thing that’s near the White House. Actually it feels good saying that. Olympus Has Fallen is a poor man’s Die Hard with an added injection of jingoism which is hilarious for anyone outside of the patriotic american bubble of stupid action films. It’s a relic from the past that has been rendered obsolete by other movies of the genre like The Raid or Dredd. However I still have a soft spot for this kind of silly, explosion filled, mindless, violent blockbuster. If you have a couple of hours to kill and you don’t feel like using your brain for a while you could do worse than Olympus Has Fallen. Which is pity as I really wanted to use my hilarious ‘Shite House Brown’ joke. hahaha superb review. Glad you got more of a. . ehem, kick. . .out of this than I did. It just annoyed me. Thanks Tom 🙂 you probably have to be slightly drunk to enjoy it. Which I was!